We’ve done two hands-on earth science projects this week – on Monday we made model planet Earths out of clay, and on Thursday we simulated the rock cycle using wax crayons. Both were great fun, and both reminded me that these kind of projects take more time and effort than I anticipate when I read about other people doing them! This post is about our experience doing the rock cycle. I hope my usual “what we might do differently next time” section will benefit you! We’ve been learning about the rock cycle and different types of rock over the last few weeks. We’ve watched Brainpop videos about weathering and erosion, and discussed how we might simulate weathering if we were using crayons to represent rocks. I’ve also been strewing rock samples from the collection I bought – just one or two at a time. By now, all of us have Mr Lee’s Rock Cycle Rap stuck in our heads (highly recommended. I was so vociferous in my appreciation of this 6th grade teacher that J(7) asked me “Are you in love with him, Mummy?”). We also enjoyed this Song of the Rocks. Just before we did the activity we watched the Rock Cycle Brainpop video and looked at pictures of the cycle in National Geographic Kids Everything Rocks and Minerals. I strewed three rock samples on the table and told the kids one was sedimentary, one metamorphic and one igneous. They examined the rocks and correctly identified the smooth, glassy one as igneous rock Obsidian. (Cue much speculation about whether they could create a Nether Portal.) We didn’t say much more about the rocks – we’ll come back to them when we explore rocks in more detail. 1. 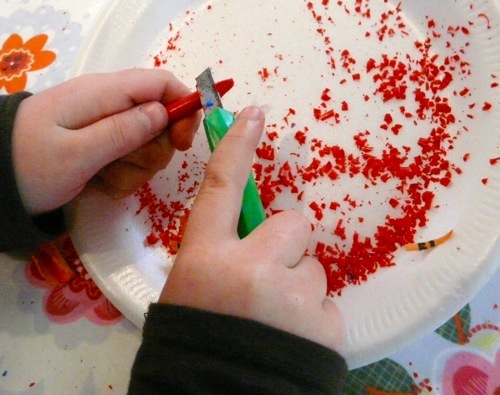 Grate or chop the crayons into small pieces, keeping the colours separate. This represents weathering and erosion. 2. 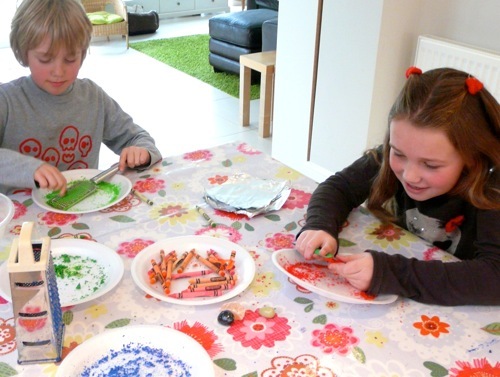 Sprinkle a layer of each colour crayon into a small piece of tin foil. This is the laying down of sediments. Fold up the foil (or put another piece on top) and press down on it very hard. This simulates the pressure that creates sedimentary rock. Unwrap your foil and examine your sedimentary rock. 3. Rewrap your squished crayon (sedimentary rock) and heat it by dunking it in very hot water for a few moments, then squish it some more. 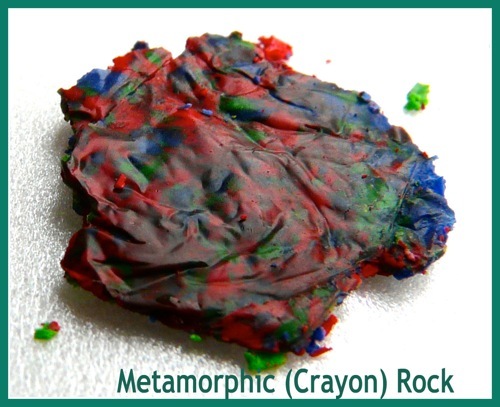 You could also use other metamorphic crayon-rocks or igneous crayon-rocks to make your metamorphic rock. This represents heat and extreme pressure inside the Earth, which creates metamorphic rock. 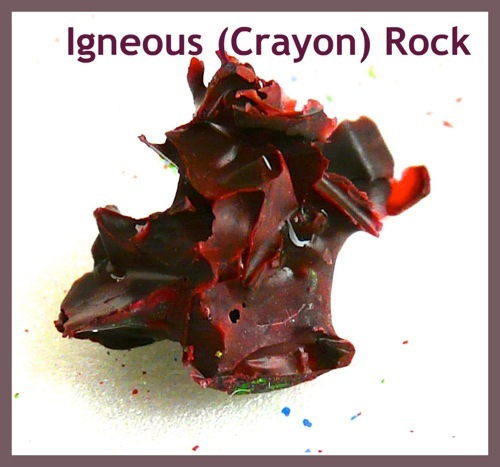 The melted then cooled crayon represents igneous rock. We let some of our melted crayons cool slowly, as would happen when magma cools slowly inside the Earth to create intrusive igneous rocks. We dunked other melted crayons (in their foil packet) in icy water to represent the fast cooling that takes place when lava cools outside the Earth, creating extrusive igneous rocks. Use metal cupcake cases as recommended by Phyllis (whose post I only just found, unfortunately!). 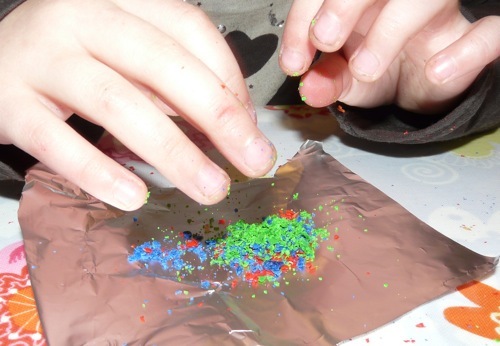 This would be much easier than unwrapping the tinfoil packets (we ended up using fresh pieces of tinfoil at each stage, and sometimes our “rocks” broke as they were unwrapped). Plus you’d get to see the melting process. Use a pencil sharpener to “weather” the crayon pieces (another hat tip to Phyllis). This sounds much easier than messing around with knives and graters! I like to involve the children at every stage, but I think next time I’d have a pre-prepared stash of weathered crayon pieces to add to the bits they make. “Weathering” takes a long time! 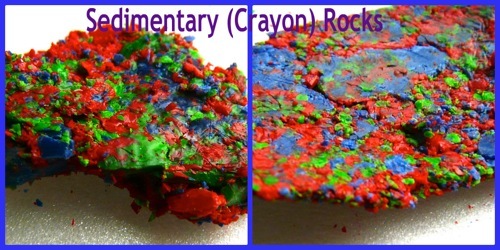 You need to apply a lot of pressure to make sedimentary crayon-rocks. To keep up the pace (especially after all that weathering) I’d have ready some big books the children could put on their foil packets and then stand on. 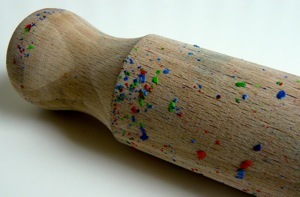 … and your rolling pin looks like this. 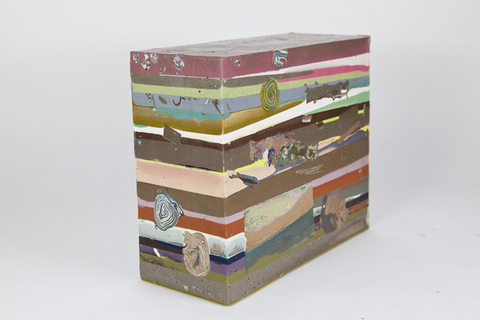 Artist Laura Moriarty compiles sculptures inspired by geology textbook illustrations of cut-aways of terrain. Isn’t this gorgeous? Wow, this is very cool, and very effective to show changes in the rock cycle! I shall have to bookmark this for when we come to study rock cycle. Also thank you for sharing your “What We Might Do Differently Next Time” section. That’ll save us a lot of learning time! Thanks, Hwee. I love how I take in all these ideas as I enjoy looking at blogs and then I can just browse through my Pinterest boards when we come to learn about the subject. Re my “What we might do differently…”, sometimes I wonder if it’s just me that finds these hands-on projects always take longer than I expect! But I suspect it’s unlikely, so I do my best to help other people save a few minutes by learning from my mistakes! LOL…Yes, I do know what you mean about homeschooling and kitchen equipment. Thank you for the mention and linking. What a great idea. 🙂 I have been glancing through and you have so many interesting ideas on your blog. Looks like you have a lot of fun. Thanks for visiting, Debbie! We do have lots of fun. I’ve just flicked back to your blog and enjoyed very much reading your “Metamorphosis” series about your homeschooling/unschooling thoughts. My children are 2E learners so, thinking about it, our curriculum-bound days were inevitably numbered! I have always thought that this project looks very cool! 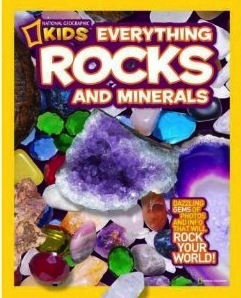 I really need to try it with my girls 🙂 We have that NG Kids Everything Rock and Minerals book. Thanks again (I left you a comment on my blog, too) for stopping by my blog and leaving me such a nice note!! Thank you so much for visiting my blog, Susan! Wow. What a great post. My son would love this. I hope you don’t mind my “copying” you. Thank you, Emily. Of course – I love being a part of sharing the inspiration! I’d pinned this earlier, but I apparently didn’t comment when I did. I love the crayon rocks, it’s a great way to teach the different styles. Thanks for the pin, Ticia. Makes it worthwhile taking the time to play with the photos on iPiccy! This is brilliant! Pinning for later when we do our rocks and minerals unit! Thank you, Katie. I love your rocks and minerals board. Have fun with the crayons! Fun post, Lula B – thought you might enjoy seeing how a contemporary artist uses these same basic processes to create sculptural works with pigmented beeswax. Hi Laura, Thanks so much for this – I love your work! I’m going to show it to my children. Cool! I love rocks! good thing someone came up with this! you know I have obsidian red jasper lapis lazuli black moon stone AND A WHOLE BUNCH OF OTHOR ROCKS!!!! Wow Matthew, you do have a lot of rocks! Which one is your favourite? Glad you found the post useful, Matthew! OK!!! I’M BACK!!!! hay can you make any more rock websites on how to make a rock??? I NEED TO HVE MILLIONS OF ROCKS!!! how about 1,000,000,000,000,000,000,000,000,000,000,000,000,000,000.000,000,000,000,000,000,000 more websites of how to make rocks ok? ok bye. Tried this and it was extremely difficult. Sedimentary went ok. Metamorphic was a disaster, crayon did not melt until we put it in tin foil over a cup of hot water and waited for AWHILE. Lots of trial and error for each step…. Did the same process with mug and tin foil. I would never do this again. I’m so sorry to hear about your finger – ouch! And what a pity you had so much trouble with the igneous and metamorphic crayon rocks. You say you tried to create metamorphic crayon-rock by putting in in tin foil “over a cup of hot water”. 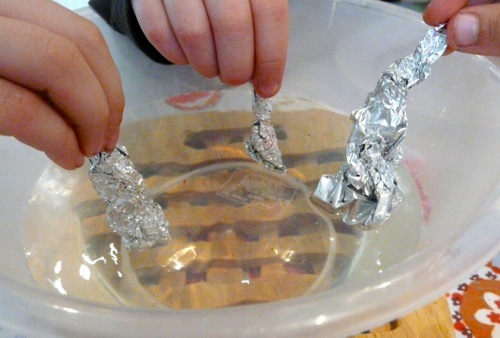 We actually dunked our tin foil packages INTO the water – perhaps that’s what made the difference? I think our igneous crayon-rock worked best in the end by holding the tin foil package directly in a flame, too. We used a tea light. Adult supervision definitely required! 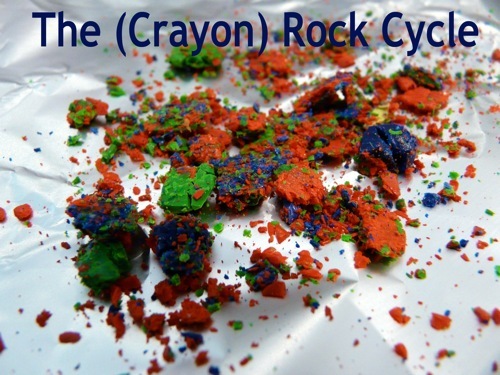 I’m very much looking forward to making a crayon rock cycle with my boys. Thank you for sharing this! Thank you Rosemary! 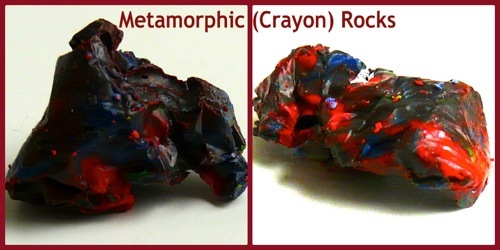 I hope you enjoy the crayon rock cycle as much as we did! Hi Jennifer – it’s a fun project, isn’t it? Thank you for stopping to say hello! I floated my tin foil cups in a crock pot of simmering water, and they melted quickly. Now that’s a good idea, Janice! I must add some tin foil cups to our science supplies, they are very useful. And the crock pot would be safer than having kids standing around a saucepan on the stove. Also, after depositing our layers of sediment in our tin foil, we folded the top down over it and stepped on it to “cement” the sediment together. This worked very well. Perfect! You’re tempting me to do this activity again, Janice! Another great song is to row row row your boat. Helps solidify the 3 varieties of rocks and their basic characteristics. That provides financial plans for its clients.